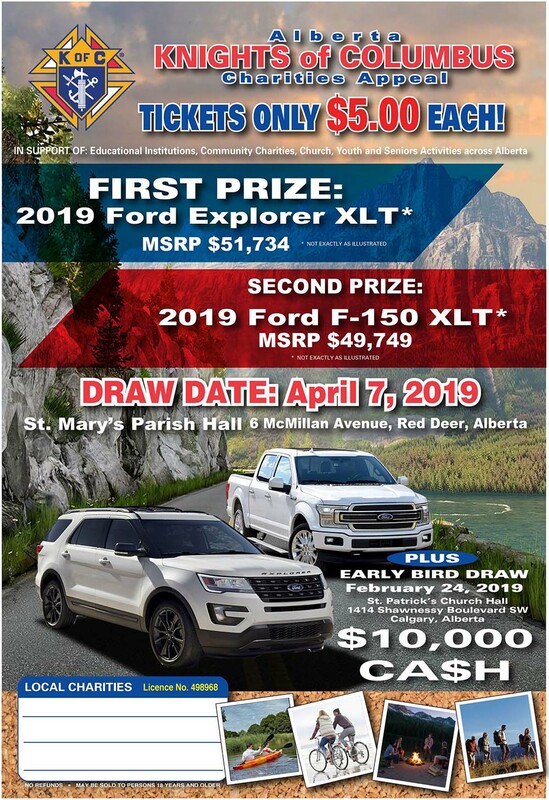 The winner of the 2019 Ford Explorer is Ron L. of Red Deer, ticket #67921. The winner of the 2019 Ford F150 is Bernice J. of Drayton Valley, ticket #37700. The winner of the $10,000 Early Bird Prize is Sherrie R. of Edmonton, ticket 31011. The ticket was sold by Council 7070. Sales stubs with these numbers did not have any information on them and they will not form part of the draw. If you purchased a ticket with a serial number showing in this table, please contact the Knights of Columbus office in Red Deer to receive a full refund, with proof of purchase. Stubs showing on this table have become lost after having been sold or are unreadable and they will not form part of the draw. If you purchased a ticket with a serial number showing in this table, please contact the Knights of Columbus office in Red Deer to receive a full refund, with proof of purchase. Books and stubs showing on this table have become lost or have been damaged and are unreadable. They will not form part of the draw. If you purchased a ticket with a serial number showing in this table, please contact the Knights of Columbus office in Red Deer to receive a full refund, with proof of purchase.